Derek, since you are using the pro version you can define the cell breaks for any resolution you like. 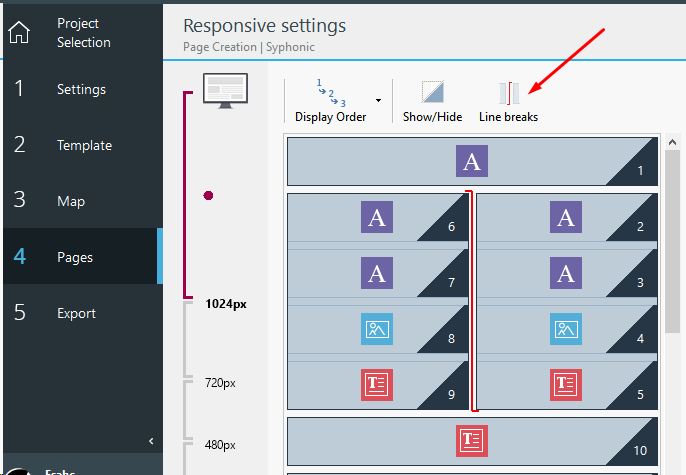 In step 4 page, select responsive settings. 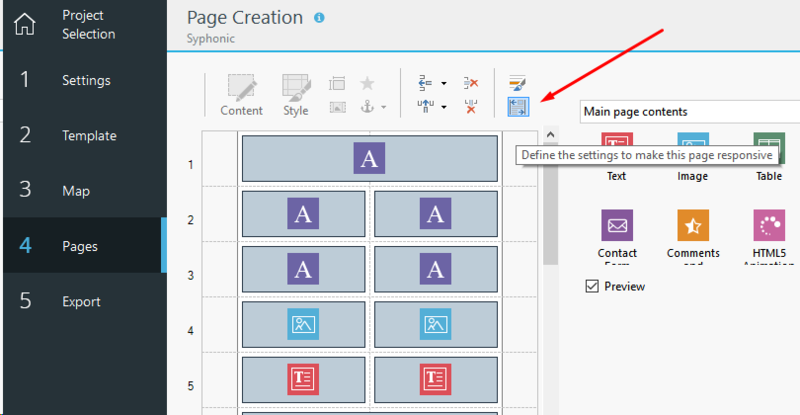 In desktop (or any other resolution) you can define the layout by adding breaks. Posted on the 02/11/2019 01:15:51 from Esahc .. Thanks for your reply and I am already aware of this function and using it in my websites. However I am trying to replicate a layout that I have seen in other websites, The issue seems not to be with the image reducing because you are viewing the site in a tablet but the fact that that text is not reducing. If you look at this site https://www.smarterwebcompany.co.uk/ you will see what I mean. This site is nothing to do with me but I like some of the layout and trying to replicate it. Any thoughts. The image and text resize at the correct portions when viewed in a tablet. If you are saying that this cannot be done in X5 then not a problem as I will change the layout to accommodate. Posted on the 02/11/2019 08:35:51 from Derek K.
I see very little difference I'm sorry Derek (perhaps I am looking on the wrong page?). The text in a text object does not resize at different resolutions in WX5 (by design). In both cases the text reformats to use the available size of the object. On the homepage at desktop and mobile view the example home page behaves exactly at it would in WX5, at tablet view they seem to crop the image of the monitor. By default WX5 will resize the image if you do not force it to it's own row. You can emulate the effect in WX5 if you wish, you could select the cell and use style to place a picture as background, this will then simply crop to suit available size of the object, although in wx5 you cannot change the column width proportions between resolutions. I have provided a very small example project to demonstrate. Posted on the 02/11/2019 09:04:20 from Esahc .. Thanks I see what you have done. I'll have a play and see if I can get the effect that I want. The important thing is that I now know exactly what the limitations are with the software. Posted on the 02/11/2019 16:07:15 from Derek K.